There may be some steps we can take when it comes Autism awareness and prevention. 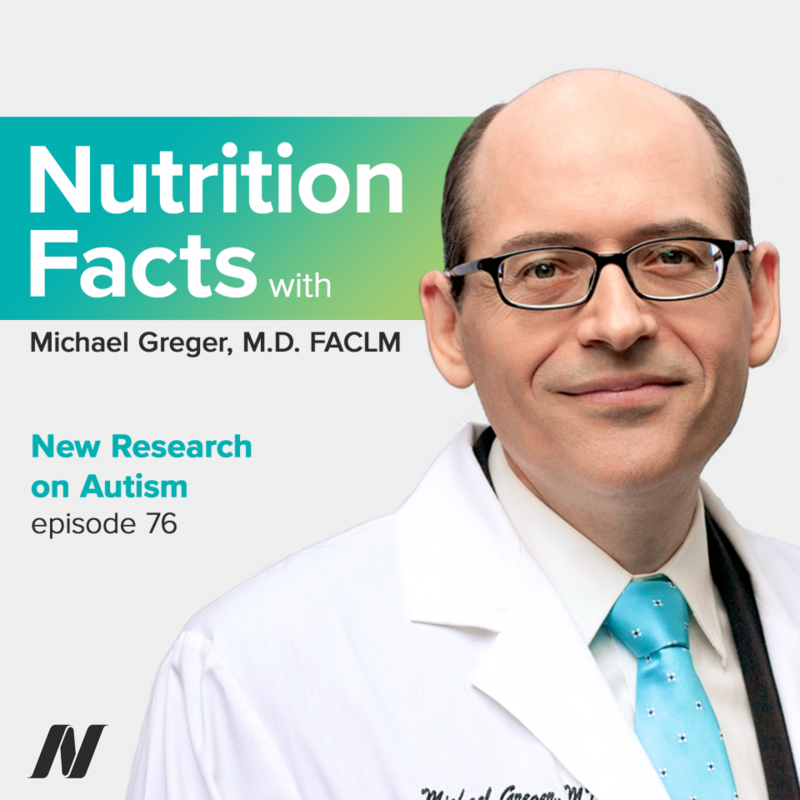 This episode features audio from Is Autism Really on the Rise?, The Role of Pesticides & Pollution in Autism, and Double-Blind Clinical Trial of Diet for Autism. Visit the video pages for all sources and doctor’s notes related to this podcast. There are lots of good reasons to try and follow a healthier diet–you lose weight, you feel good, but the main reason–to live a longer, happy, productive life. Sounds good, right? And though it may sound deceptively easy, the devil is in the details. Welcome to the Nutrition Facts podcast. I’m your host, Dr. Michael Greger. On today’s show, we take a look at new research on autism, the neurodevelopmental disorder characterized by impaired social interaction, impaired verbal and non-verbal communication, and restricted and repetitive behavior. Before speculating about the reason for the “explosive” increase in autism, one has to make sure the explosion is real. In 1943, a famous paper was published in which a child psychiatrist at Hopkins described a series of children with so-called “fascinating peculiarities.” He thought these characteristics formed “a unique ‘syndrome’” he called autism, which seemed rare at the time. But, who knew how many were out there undiagnosed? This is good news. I mean, the larger role these non-genetic factors play in causing autism, the more “modifiable [the] risk factors” may be, potentially “open[ing] up avenues for the primary prevention of…autism” in the first place. Since autism as a medical condition was first described, the prevalence of autism has apparently exploded from like “1 in 5000 individuals to 1 in 68…” now—more than 1% of the population. That would be like a 7,000% increase. And, indeed, you’ll see exponential increase in the prevalence of autism, from like no diagnosed cases in the early 1900s, to the prevalence shooting through the roof in the ‘80s and ’90s. And so, that immediately gets you thinking: what happened around that time that could account for the explosion? But, wait a second. Of course, there were no diagnosed cases in the early 1900s; it didn’t even have a name until 1943. As Kanner said in the original paper, there’s probably more cases out there, but they just hadn’t been looking. The prevalence of autism diagnoses depends on what diagnostic criteria you’re using, and whether you’re out there looking for it or not. “Put another way, historical prevalence estimates for autism…[and its rarity] might well have been underestimates of the true prevalence” back then; may have just been missing lots of cases. The “[i]ncreased recognition among doctors” and society at large, the “broadening of the diagnostic concept over time” and different studies using different criteria may account for [much] of the apparent increase in prevalence, although this [can’t] be quantified.” So, before we start speculating about the reason for the explosive increase, maybe we should first make sure the explosion is real. The bottom line is that, while we may never really know what the prevalence was a half century ago, we do have decent data over the last few decades that really does point to a considerable increase in the true prevalence. So yeah, maybe there wasn’t actually a “22…-fold increase” in autism in the ‘80s and ‘90s; maybe there was actually only an “8…-fold increase.” So yeah, we may quibble whether the increase was 800%, or closer to 2,000%, but the bottom line seems to be autism rates are really increasing. And so, the question legitimately then turns to: Why? Our next story takes a close look at the effects of smoking, pesticides, vaccine mercury, and air pollution on autistic spectrum disorder risk. “If we really want to protect children’s brains from chemicals…, we first need to recognize and deal with the massive dearth of basic hazard and exposure information [about any] risks posed by environmental chemicals.” A lot of the data we do have is from “preclinical studies”—meaning like test tubes and lab animals. Well, yeah, it’s not like you can expose people on purpose. That’s where epidemiological research can step in: studying exposures within populations. That’s how we found out about other well-known hazards, like benzene and asbestos. You can’t ethically force people to smoke for a study, but you can note how many people exposed to cigarette smoke, day in day out, get lung cancer, compared to nonsmokers. For example, there’s a bunch of studies on the effects of smoking during pregnancy on autism rates. I’ve talked about these so-called forest plots before, where values greater than one suggest at least a tendency towards an increased risk, whereas the values less than one suggest more of a protective association. And should the whiskers cross the line, then that means that particular finding did not reach statistical significance. This allows you, with a quick glance, to interpret a huge amount of data from multiple studies. Does it look like smoking during pregnancy has any effect on autism rates? No; about half skewed to one side, half to the other, and hardly any of the results reached statistical significance—meaning they may have just been largely chance findings. But check out the air pollution data. This is exposure to car exhaust and diesel fumes during pregnancy and infancy. But, correlation doesn’t necessarily mean causation. This could be a true cause-and-effect relationship, or maybe it’s just that poor people live in the inner cities next to polluted highways, or the traffic noise is causing stress, or some other confounding factor. What happens when children with autism on gluten- and casein-free diets are covertly challenged with wheat and dairy? Here’s the story. Okay; so, what if you don’t just rely on parental report? What if you do a blinded study of a gluten- and casein-free diet? The parents know what the kids are eating, but you don’t just ask the parents how the kids are doing; you have investigators objectively assess all the kids, without knowing who was in which group—the diet group or the control group. And, they found “a significant beneficial…effect at 8, 12, and 24 months…on core autistic…behaviors” with a gluten- and casein-free diet. And, this was one of the largest such studies ever done—starting out with 73 children. But, they didn’t end up with 73, since about a fifth dropped out—mostly from the diet group. Be sure to check out my new How Not to Die Cookbook. It’s beautifully designed, with more than 120 recipes for delicious, plant-based meals, snacks, and beverages. All the proceeds from the sales of all my books all go to charity. I just want you to be healthier.